Jacob's grandpa tells stories. Real whoppers about an island of peculiar children and monsters. Jacob doesn't really believe these stories. Then his grandfather is killed in a way that has Jacob questioning what is real. He convinces his father to take him to this mysterious island off the coast of Wales. It doesn't seem very magical. He is disappointed until he finds the children- yes, children- still living just as his grandfather left them with Miss Peregrine. As he gets to know them, he learns he might be the only person who can protect them from the monsters. First, sequels= Nooooooooo! And 2013, what?!! I've often looked at old photographs and wondered what the story is behind them. Who were the people and what were they doing? There is something eerie about looking at a person long dead frozen in one moment in time. Ransom Riggs didn't just wonder, he made up a fantastical story using old photographs. And what as story Miss Peregrine's Home for Peculiar Children is! I was immediately drawn in by the writing. There is no dallying around; Riggs gets straight to it. The pacing is quick, so quick I read the book over one day. I didn't want to put it down. The world Riggs creates for the children is quite clever and I appreciated the explanation for their powers. This wasn't just, "oh, they're magic." He gives them a reason for existing. For the most part, I liked Jacob, though he was thoughtless and insensitive after his grandfather dies. He acts as though no one else lost someone important. I just wanted to smack him for the things he says to his father. Later, he does act bravely and redeems himself in my eyes. The photographs were well chosen and help to tell the story. I spent a lot of time just looking at them. The only ones I didn't really understand were the clown children. I'm not sure what special skill they had other than being super creepy. 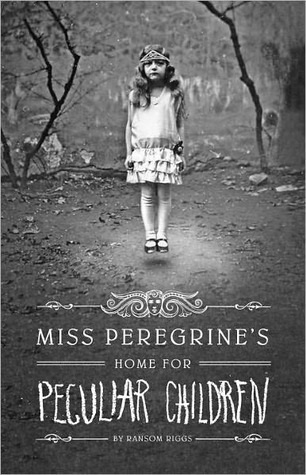 Miss Peregrine's Home for Peculiar Children is just the right amount of strange and a lot of adventure. It's a perfect Halloween read. Now we all have to twiddle our thumbs until 2013 for the next installment. I just ordered this book this week and can't wait to dive in! Everyone seems to like this one. I have it on my list and keep meaning to pick it up for October but I seem to be running out of time! Is this a YA book? I assumed it was but now I am thinking it's not. I loved te creepiness of this book and the accompanying photos. 2013???? That's way too long to wait! This was such a perfect read for the R.I.P. Challenge. It's creepy, but also fascinating. This sounds like it's perfect for October! I read it and enjoyed it except for the ending..although I know they had to make it that way so they could do more books...but I don't feel that that the father should have been left out and not even know about his father like that. Karen- Hope you enjoy it! Ti- I think it's categorized as YA but adults would like it too. Lola- Glad you liked it. DesLily- I wasn't too pleased at how the parents were treated in the story. Maybe it's because I'm a Mom. Kailana- That's what it says on Goodreads anyway. This book is on the top of my to-read list, so I was happy to see your review. Actually, I'm glad to read what you wrote about the photos--now I know to buy a print copy as Kindle does not do well with pictures. Thanks! Hmmm - I still want to read this but now that I know there's a sequel and it's not out until 2013 I don't feel the need to read it right away.